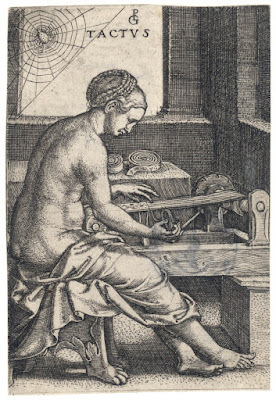 “Tactus” (Touch), c1544, Plate 5 from the series of five engravings, “The Five Senses”. 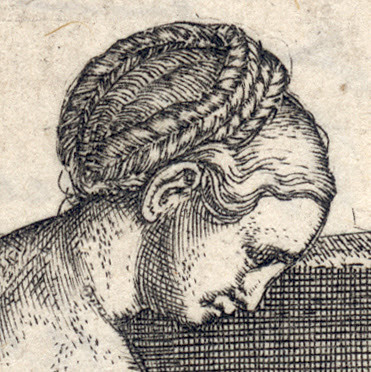 Engraving on laid paper trimmed along the image borderline with the text line, "SED ARANEA TACTU”, below the image borderline removed. Signed with the artist’s monogram, "PG", in the plate at upper centre and lettered "TACTUS" below the monogram. TIB 16 (8) 109 (354) (Walter L Strauss & Jacob Bink et al [Eds.] 1980, “The Illustrated Bartsch”, vol. 16, p. 124); Landau 1978 108 (David Landau 1978, “Catalogo completo dell' opera grafica di Georg Pencz”, Milan); Hollstein 107 (F W H Hollstein 1954, “German engravings, etchings and woodcuts c.1400-1700”, Amsterdam); Bartsch VIII.355.109 (Adam Bartsch 1803, “Le Peintre graveur”, 21 vols, Vienna). 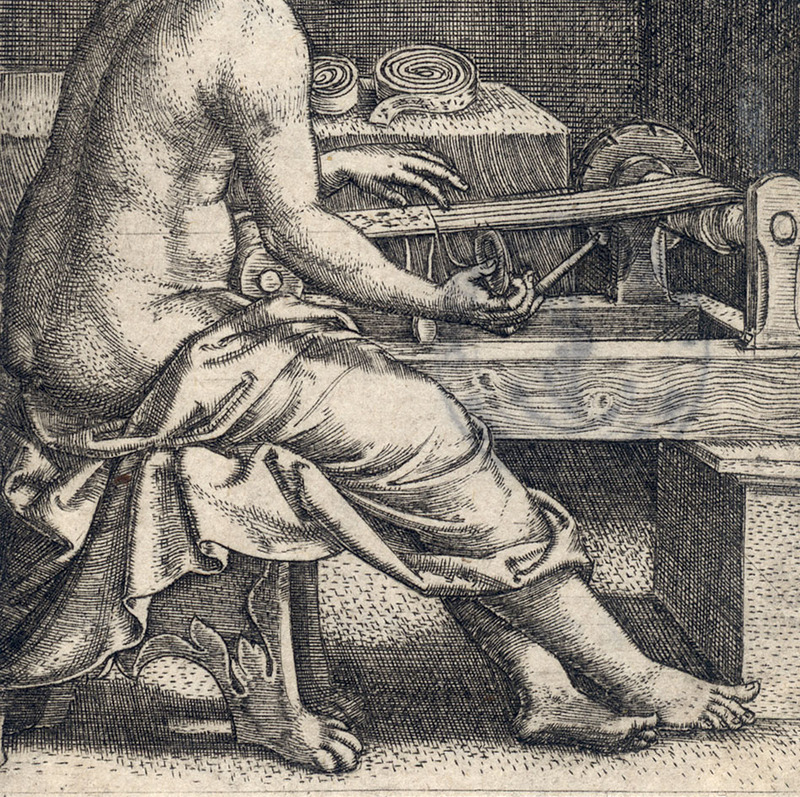 See also: Giulia Bartrum 1995, “German Renaissance Prints”, exh. cat., BM, London 1995, no.111e, p. 120. 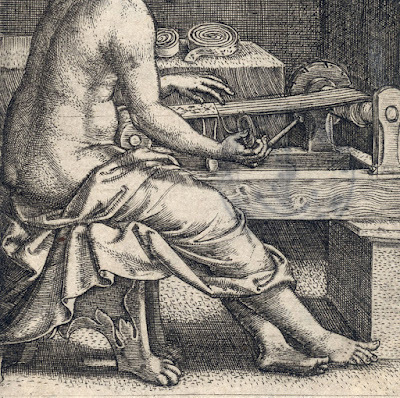 Condition: richly inked (lifetime?) 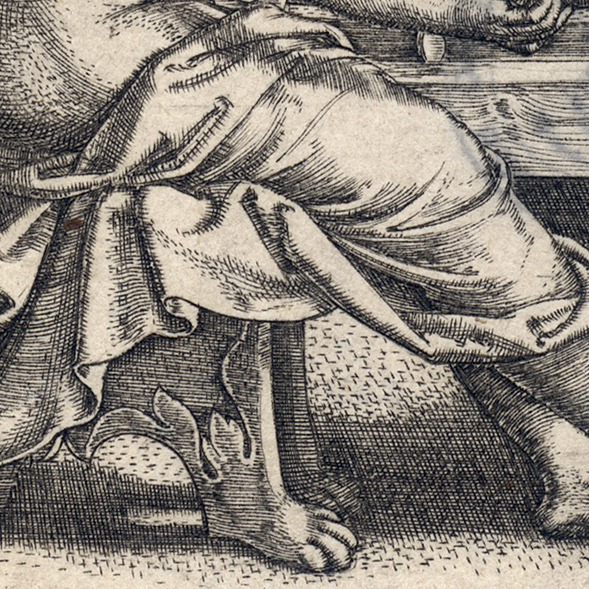 impression in near faultless condition, trimmed along the image borderline and without the text line below. 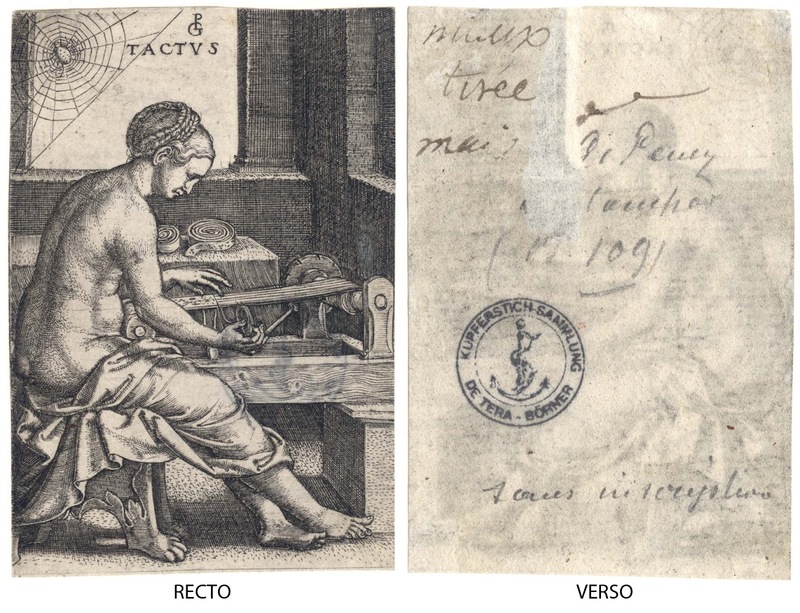 There are numerous inscriptions in pencil and ink and an ink stamp from previous collectors (verso). I am selling this very small but exquisitely rendered engraving by one of the famous German Little Masters —the shared interest of the group in executing little prints is exemplified by this postage-stamp sized masterpiece—for the total cost of AU$400 (currently US$317.01/EUR265.02/GBP233.44 at the time of this listing) including postage and handling to anywhere in the world. If you are interested in purchasing this precious and exceptionally rare print that is the first visual expression in history of the sense of touch, please contact me (oz_jim@printsandprinciples.com) and I will send you a PayPal invoice to make the payment easy. At first I was a baffled by the symbolic relevance of the spider featured at the upper left of this print, after all the print should be expressing what the title proposes: the sense of touch. After thinking about what a spider “does” stretched out on its web, however, the mystery was not really a mystery at all. I quickly realised that spiders rely on their sense of touch to alert them to when a potential dinner has tangled itself in the spider’s web. So sensible! I now love the idea of a spider as a symbol of touch sensitivity. Indeed, I think that a spider may be the best choice of all to symbolise the sense of touch. 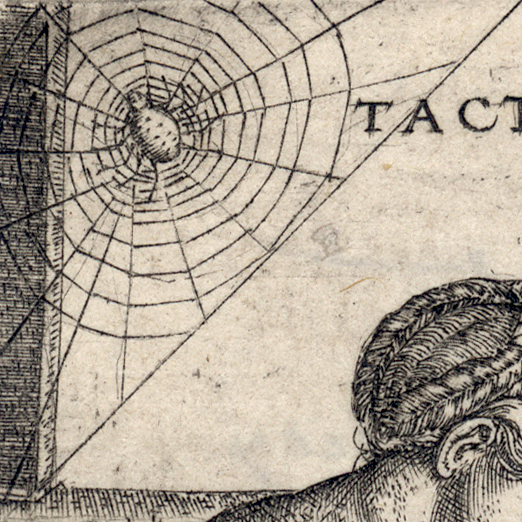 Pencz’s choice of a spider is interesting as this engraving and the other plates from the same series are the first prints to showcase the five senses. 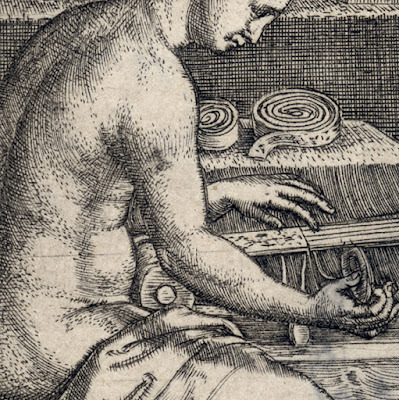 Curiously, after the publication of this engraving, the symbols of touch focused more on turtles, snails and the loom—the latter features in this print. To be honest, I think Pencz’s choice of the spider is perfect and the relevance of the turtle and snail to symbolise touch seems quite tenuous to me. 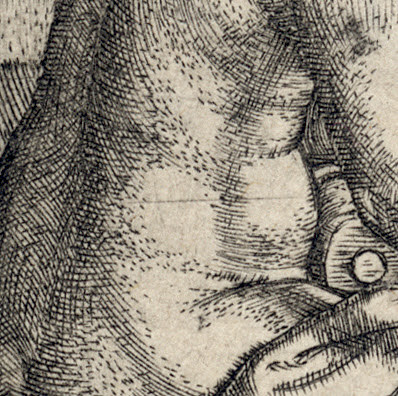 I can vaguely perceive the relevance of the turtle as a symbol of touch, as the texture of its shell has tactile appeal, but I struggle with a snail as an appropriate symbol—but I admit that I have no idea about what goes on in a snail’s head regarding a sense of touch as it slimes its trail over surfaces.